Planners in Scotland and Ireland have established a good working relationship. We have done this through biannual meetings of the Five Administrations and involvement in the British Irish Council spatial planning work stream, which allows sharing of ideas on planning, architecture and innovation in placemaking. 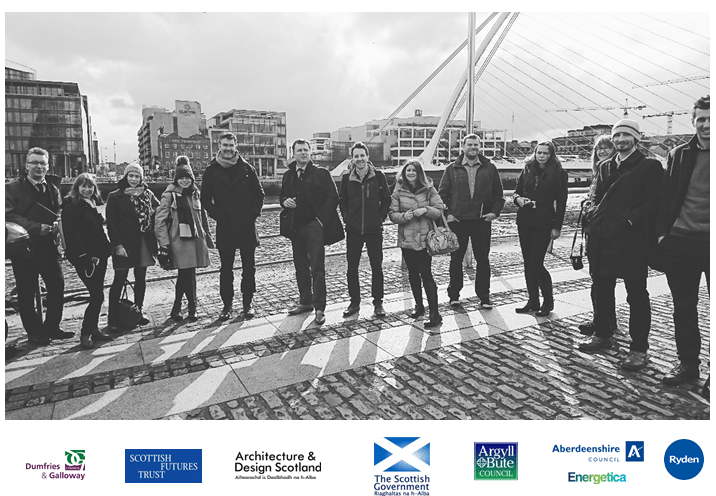 As part of the Review of the Scottish planning system, Planning and Architecture Division (PAD) is taking the opportunity to learn more about other planning systems and ideas that could be applied in Scotland. We recently organised a study visit to Dublin on 23rd to 24th March 2017, to explore more about Irish Strategic Development Zones (SDZs). The delegation from Scotland included officials from PAD plus representatives from our Simplified Planning Zone pilot authorities (Aberdeenshire, Argyll & Bute and Dumfries & Galloway Councils), Architecture + Design Scotland, Scottish Futures Trust, and Ryden (who we have been commissioned to carry out research on SPZs and equivalent mechanisms used out with Scotland). The Scottish delegation at Dublin Docklands, within the North Lotts and Grand Canal Strategic Development Zone, with the Samuel Beckett bridge in the background. Colin Ryan, Senior Adviser from the Department for Housing, Planning and Local Government hosted the visit. He opened discussions by outlining the legislation and procedures for preparing SDZs. SDZs are used in Ireland to support developments of national importance. and must be approved through Parliament. Designating SDZs and providing Parliamentary support provides a focus on these nationally important developments for prioritising infrastructure and investment. Development agencies then have 2 years to prepare a draft SDZ planning scheme for the site indicating how the site is to be developed. The draft needs to include details on the type of development to be permitted, its extent and information on design. The planning scheme is approved either by the planning authority directly or by An Bord Pleanala (the Irish Planning Appeals Board) at appeal. Importantly in Ireland, third party rights of appeal against the planning authority’s decision are removed within SDZs, with the scheme itself having been through this appeal stage. Consequently SDZs provide applicants with a much greater degree of certainty. Both in relation to securing planning permission and the timescales for doing so. Once made, the SDZ scheme forms part of the development plan. Although applications for planning permission are made in the same way within SPDs as everywhere else, applications for proposals which then come forward must be approved if they comply with the scheme. This provides certainty to all parties. We also heard from Chris McGarry, Head of Planning at the National Asset Management Agency (NAMA)(https://www.nama.ie/). NAMA is the Irish government agency created to help address the serious problems which arose in Ireland’s banking sector as the result of excessive property lending. NAMA’s powers include the development of land to which an eligible asset relates if it will provide medium and long-term returns to the State and will help promote economic growth. and interrogation of costs and active engagement by the planning authority. The visit looked specifically at the North Lotts and Grand Canal SDZ, which covers 66ha in Dublin’s Docklands. It was designated in 2012 to reignite development in the Docklands and Dublin’s inner city following the earlier economic downturn. NAMA controls approximately 70 to 80% of sites and buildings in the Docklands area and plans. They also have invested significantly in redeveloping the area. John O’Hara, City Planner & Head of Land Use Policy at Dublin City Council outlined the vision for the area to become a world-class maritime quarter with a distinctive Dublin character – a model of sustainable inner city regeneration incorporating socially inclusive urban neighbourhoods; a diverse, green innovation-based economy contributing to the prosperity of the locality, the city and the country; all supported by exemplary social and physical infrastructure and a quality public realm integrated with the wider city. and other major office HQs and new flats within easy walking distance of the city centre. 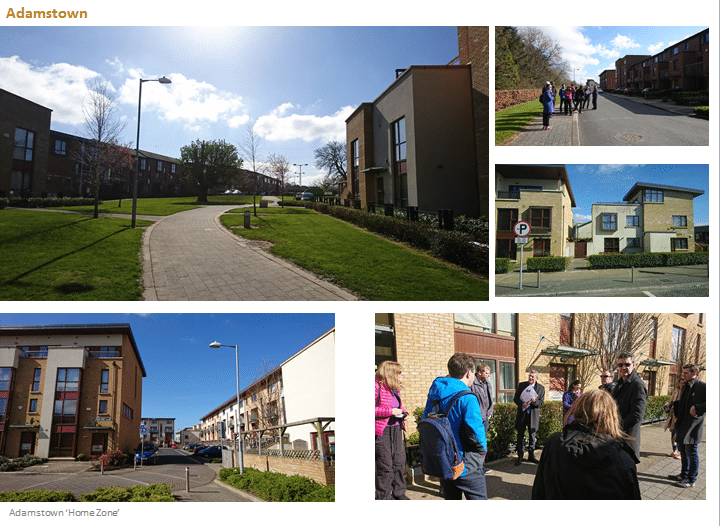 The study group also travelled to Adamstown, the first residential SDZ in Ireland. The Adamstown Planning Scheme aims ‘…to create sustainable communities rather than just housing developments’, using ‘…a holistic approach that integrates land use, transportation, housing, urban design, ecology and energy efficiency’. The SDZ scheme area covers 223.5 hectares. It is subdivided into eleven development areas and four amenity areas including a Home Zone and a mix of housing types. The site lies to the west of Dublin within commuting distance the city centre. It is served by a rail line and a new station put in upfront by the developer. and the Environmental Appraisal including proposals to the minimise adverse effects on the environment. The group also spent some time at Fumbally Exchange a not-for-profit movement of creative and innovative professionals who share co-working spaces, at their hub in Dublin city centre. Stephen Musiol, an architect at Small Spaces welcomed us for the afternoon. Stephen led a series of presentations on Homes for Smart Ageing, and age friendly communities. Including proposals for adapting and splitting homes to help address the rapid increase in the rise of the ageing population and the demand for housing in Dublin. We also heard from Jo Lewis from Inspirational Homes Ireland who have a website which showcases building designs and techniques that have been used in County Leitrim. They aim to offer support and encouragement to home-builders/architects and designers. As well as facilitate sharing of experiences, knowledge and skills amongst builders, homeowners, architects, self-builders and anyone with an interest in making sustainable the future of building in Ireland. The study visit offered lots of food for thought and inspiration of ideas which will inform the SPZ pilots. As well as the research and influence Scottish Government’s wider thinking on the Planning Review going forward. We would like to extend our thanks again to all those involved in supporting the visit for their hospitality, time and expertise. See more about the visit, and the SDZs here. You can read more about the review of the Scottish planning system and Simplified Planning Zones on our website.